Whenever it's required to take a look at the contents of a directory on the command line in Linux, ls is the command that's used. It lists the contents sorted in alphabetical order. While that's the tool's basic usage, it offers a plethora of features (in the form of command line options) that help you in several circumstances. In this tutorial, we will discuss the usage of some of these command line options through easy to understand examples. When using the -a command line options, the entries for the current and previous directory (. and .. respectively) also show up. If you want ls to not display these in output, use the -A command line option instead. By default, the ls command displays the files alphabetically in the output. 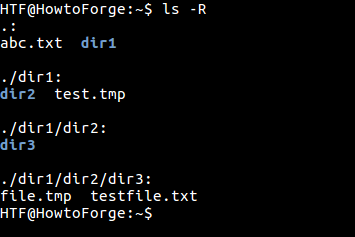 But if you want, you can also make the tool display files in reverse order. For this, you'll have to use the tool’s -r command line option. 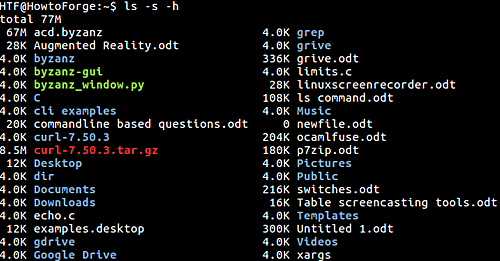 To sort the ls command output alphabetically based on file extensions, use the -X command line option. As you can see in the screenshot above, among the files with name containing an extension, 'echo.c' is listed first, and 'byzanz_window.py' is listed at the end. If you want to quickly know which files or directories were modified recently, then you can use the ls command's -t option. The -t command line option displays newest entries first. If you want, you can make the ls command display contents of subdirectories as well. This can be done using the -R command line option. The ls command also lets you list file/directory names along with their respective inode numbers. The tool provides the -i command line option to access this feature. As you can see in the screenshot above, the numbers on the left are inode numbers, while the names on the right are corresponding file/directory names. The ls command can also print detailed information about files and directories. To enable this output format (also known as long listing format), you need to use the -l command line option. The last is the name of the file. You can also ask the ls command to list each file’s author when producing long format directory listings. For this, you have to combine --author option with -l.
As you can see in the screenshot above, the newly-added fifth column is for author. Note: The official GNU website says, "In GNU/Hurd, file authors can differ from their owners, but in other operating systems the two are the same." Suppose the current directory contains a file with name having a new-line character. If you try listing the contents of that directory, that particular file name will be shown containing a question mark (? ), which signifies a non-printable character. However, the ls command provides an option that - when used - prints C-style escape characters for non-printable characters. The option in question is -b. So you can see in the screenshot above, the -b option lead to ls printing '\n' for newline character. Similarly, spaces get represented by '\[space]' in this mode. If you want to know the size of a file, you'll have to use the -l option (that enables long listing format) we discussed in point 3 above. The size gets displayed in bytes by default. However, there may be situations where-in you would want the size in kilobytes or megabytes. Keep in mind that the size figure produced with -l command line option is the actual file size, or the amount of data it contains. If, instead, you want to know the the size of the file on the file system or allocated size (yes, it can be different), then you'll have to use the -s command. For more information on difference between file size produced by -l option and -s option, head here. If you want the ls command output to only contain file/directory names and their respective sizes, then you can do that using the -h option in combination with -l/-s command line option. 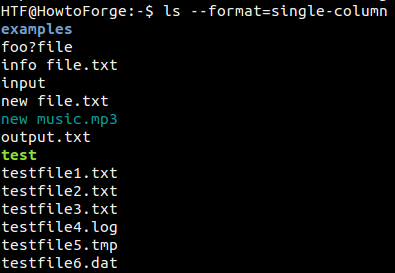 In Linux, backup files are represented with names ending with a tilde(~). The ls command provides an option (-B) using which you can ask the tool to not list backup files in output, in case that's what's needed. For example, the following screenshot shows two ls commands. The first one outputs the name of a backup file, but the second one (which uses the -B option) doesn't. By default, the output that the ls command displays is color coded, where different colors represent different types of files. However, if you want, you can also have the tool append an indicator (for this purpose) to entries in output. This feature can be accessed using the -F option. If you want, you can also change the output format for the ls command. The tool's --format option lets you do this. This option requires you pass a value that indicates the type of output format you want. Available values are: 'verbose' or 'long', 'commas', 'horizontal' or 'across', 'vertical', and 'single-column'. The following screenshot shows the output both without and with the --hide option. While ls is a very basic command, how effectively it can be used depends on user's knowledge of the command line options the tool provides. Do try the options we've discussed here in tutorial, and in case of any doubt or query, head to its man page. Use this almost exclusively. Would like to have the available: free space AND total files/total directories (in current directory) available on the bottom of the listing but don't know how to do that. Similar to the way the DOS dir command worked.